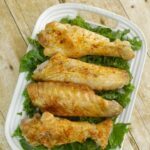 These giant turkey wings are seasoned with paprika then roasted to perfection! A zero carb recipe. So… as you probably know I’m a huge fan of chicken wings. Unless they’re breaded or battered they’re naturally low in carbs, and you can add endless different flavorings and sauces to them. Therefore, it was obvious that I should try TURKEY wings one day. And what can I say? They are HUGE. Well yes, I expected them to be bigger than chicken wings, of course. But wow! Also, they’re super cheap. I picked up four whole wings for just under $8 – and one wing is pretty filling!!! For my first time cooking them, I decided that they should be cooked plainly. I lined a baking sheet with foil and placed a rack on top. Then I trimmed up the wings (I cut off the wing tip, and some excess skin, but wasn’t able to separate the drumette from the wingette*). I placed them on the rack, drizzled them with olive oil and seasoned them with salt and pepper. *This wasn’t a problem as I just separated them after cooking. I roasted them in a preheated oven until they were cooked through. And this was the only tricky part. I used probe thermometer, which suggested the meat needed to reach 180F. But I thought I had read elsewhere that it was lower, and I found instructions for both 165F and 170F! Apparently there’s quite a debate over it! My best advice is to cook it to your liking – just make sure that they don’t dry out! Set the thermometer to maybe 165F, making sure the thermometer is in the thickest part and not touching a bone. Oh, and just before the cooking time had ended, I sprinkled some paprika over the wings. 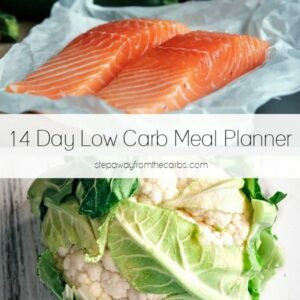 Delish – and zero carb!!! 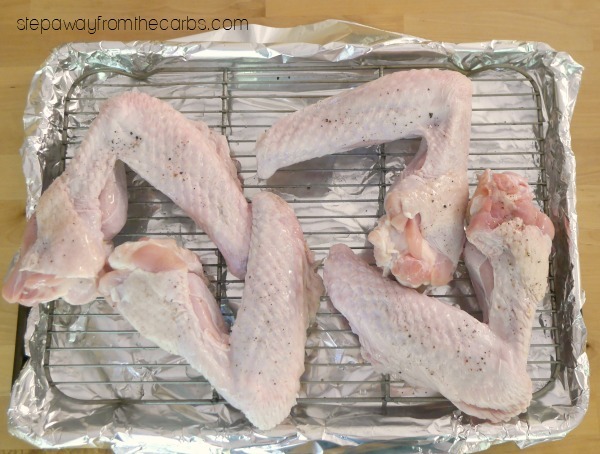 These huge turkey wings make a change from chicken! 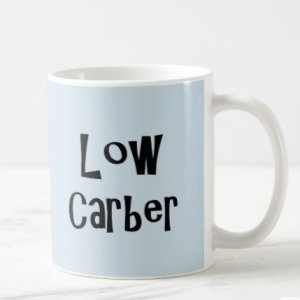 Great for low-carbers! Preheat the oven to 375F. Line a baking pan with foil, and place a metal rack on top. 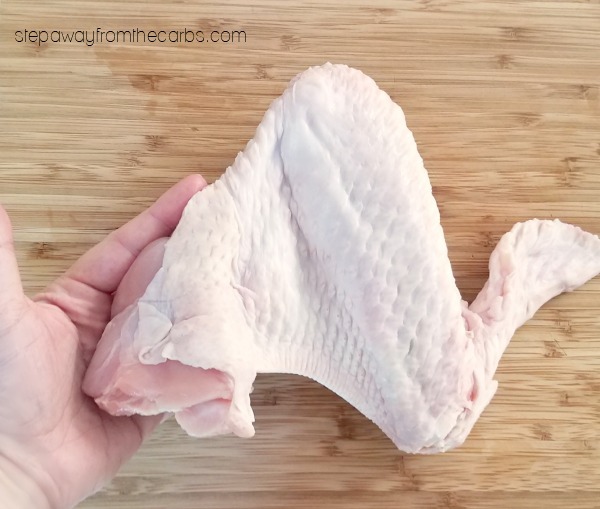 Prepare the wings by removing the wing tips and any excess skin or fat. Separate the drumette from the wingette if possible (if not, you can do this after cooking). Place them on the rack and drizzle them with olive oil, then season them with salt and pepper. Roast until the wings are cooked to your liking, at least 165F. 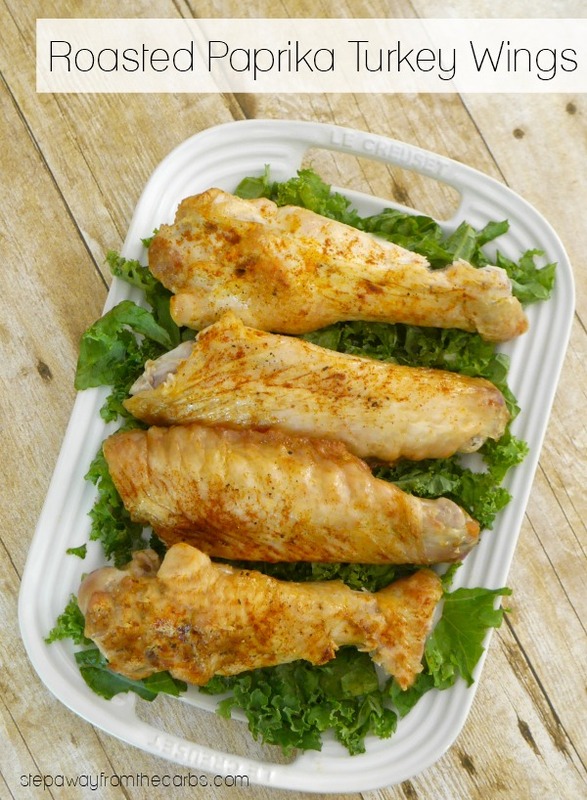 During the last few minutes of cooking, sprinkle paprika over the wings and return them to the oven. 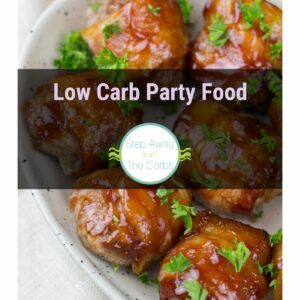 Check out my Low Carb Party Food Ebook! Are you planning a party? 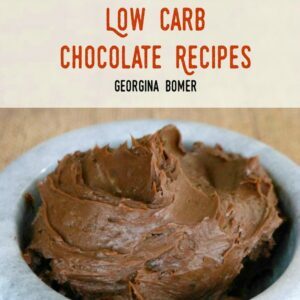 Check out my mini ebook for low carb recipe inspiration!